BLT Steak is the interpretation of the American Steakhouse, combining bistro ambiance with steakhouse fare. Indulge in signature warm popovers, acclaimed selection of steaks, fresh seafood, satisfying sides and creative desserts. The wine list is modeled after other BLT Steak Wine Spectator’s “Best of Award of Excellence” award-winning lists. Expect more than 300 wines with Old World selections from the regions of Burgundy, Bordeaux, Piedmont, Tuscany, Rioja and many others. Promotional value expires Jul 1, 2019. Amount paid never expires. Not valid holiday or holiday weekends. Reservation required. Not valid on Valentine’s Day. Not valid on Christmas Eve. Not valid on New Year’s Eve. Limit 1 per person, may buy 2 additional as gift(s). Limit 1 per visit. Must use promotional value in 1 visit(s). Valid only for option purchased. Not valid with other offers or promotions. Merchant is solely responsible to purchasers for the care and quality of the advertised goods and services. Offer is not eligible for our promo codes or other discounts. BLT Steak may be new to Las Vegas, but its team is hardly starting from scratch. In New York City, BLT has been honored with AAA Four Diamond awards every year since 2004. 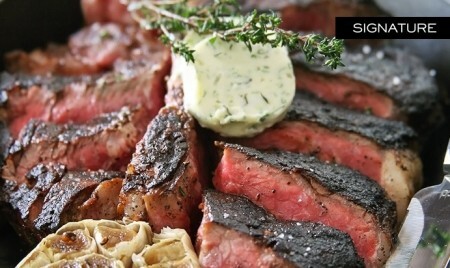 In Miami, BLT was named Best Steakhouse by Miami New Times in 2010. Eight additional locations, including in Puerto Rico and Arizona, have accrued multiple Awards of Excellence from Wine Spectator. So, with the newest location inside Bally’s, BLT Steak has built upon these successes while introducing elements that are uniquely Las Vegan. For instance, the kitchen stays open as late as 11 p.m. to serve dinner to those sampling the local nightlife (perhaps at Victor Drai’s Indigo Lounge, which is just steps away). But even late at night, diners can expect a top-notch meal—the menu focuses on 28-day dry-aged steaks cut from Black Angus beef. Broiled at 1700 degrees to lock in natural juices, the steaks come in cuts ranging from a 10-ounce filet to a massive porterhouse for two hungry people or 35 people who want exactly one bite. Other popular dishes include gruyere-stuffed popovers, a tuna tartare appetizer, and peanut butter chocolate mousse with banana ice cream. Throughout the meal, guests can pair their courses with selections from the sprawling wine list, whose 300-plus varietals focus on old-world styles made in Burgundy, Bordeaux, Tuscany, and other European cities.